Bella Vista viewed from the hillside behind. As of 8/19/2017 we had a total of 74 Airbnb reviews (combined for Casa Pacis, Bella Vista, and Alta Vista), Of these, 84% had 5-Stars, 14% had 4-Stars, and 1 had 3-stars. We have included here just a small fraction of these reviews. Below find reviews and a selection from hundreds of guest book entries by satisfied renters of Bella Vista, giving valuable hints what one can do and experience at Sea Ranch. “Bella Vista does not disappoint. Klaus was very responsive before we arrived, the house was in great condition and the views are incredible. Perfect for a relaxing weekend getaway. Would definitely recommend staying here. “We enjoyed a wonderful and serene weekend at Bella Vista! The home was charming, sparkling clean, and comfortable with everything we needed to enjoy a few days relaxing, cooking, reading, and hiking. The views were superb! It was lovely to wake up every morning and open all the shades to reveal the beautiful vista of the ocean and meadows. We saw whales while enjoying breakfast and took long hikes along the coastal trail. The kitchen was well equipped for cooking and baking and the quaint town of Gualala just a short ride down the road offered a wonderful market and Trinks Cafe (highly recommend). The cozy couch and fire stove were perfect for evenings relaxing with books and enjoying conversation. A wonderfully peaceful and fulfilling vacation! Communication and information were timely, helpful and clear. Highly recommend - we shall return! “The best Airbnb we’ve ever stayed in! The house is even more beautiful than in the photos and the view is absolutely spectacular! Klaus provides every possible amenity that helped to make our stay peaceful and comfortable! Thanks again and we hope to return in the near future!" "A multi-level space in a beautiful coastal setting with a clear and descriptive booking that made the spontaneity of our trip seem effortless and super adventurous. Klaus and Gundi have created and share a paradise place with all the tools and resources you need to enjoy your experience. Highly recommended!!!" "My husband and I have stayed at numerous Sea Ranch homes and this is one of the most ideally situated—on the west side of Rt. 1 in the upper mid pastures, shielded from neighbors, and overlooking a unobstructed 180 degree view of the beautiful blue ocean. It was not only calm and relaxing, but we also got a treat by observing a flock of nearby grazing sheep. The home is comfortable, with plenty of spots to lay back and read or listen to music. The kitchen is equipped with everything you'd expect in your own kitchen. I'd recommend this home to anyone who wants to leave their cares at home and relax with the ocean just a blink away." NOTE BY OWNER: When I called the guest why she had only given a 4-Star rating, she stated that they were a bit "annoyed by the bleating of the sheep" grazing around the house. (Little was she aware that it is considered an extraordinarily fortunate experience when the herd of about 400 sheep, used as "fire prevention" to graze on Sea Ranch grounds, happens to be nearby. This occurs about once to twice a year for 2 days. The experience is particularly endearing at this time of the year, in the lambing season … ). "This house is up on a little hill with beautiful views of the ocean. Close enough for the view but not too close to get the wind. This house is charmingly decorated. The kitchen has many more amenities than other houses we have rented like dishes, pans and glasses. The bed in the master was extremely comfortable. The jacuzzi worked well. We had six wonderful days celebrating our anniversary. We will be back!" "Klaus and Gundi’s Sea Ranch house (“Bella Vista”) sits on top of a small hill with a stunningly beautiful view of the coastline and ocean. From our first contact, Klaus was timely, thorough and kindhearted in our interactions. The house was very easy to locate among the maze of meandering streets of Sea Ranch and, standing on a hill visible from the coastal trails, it was quite easy to find our way back after long and spectacularly beautiful walks along the coastal bluffs. We found the house clean, well-supplied and very well equipped (fully equipped kitchen with everything one needs for cooking and dining, fast internet, gas BBQ, washer/dryer and the like). The living room, dining room, bedrooms and an elevated sitting area are all nicely appointed and have more than sufficient space and comfortable seating. Best of all, glass windows run from the kitchen, along the dining area and through the living room, providing a spectacular 180 degree view of the meadows and coast. And, there is a delightful patio opening via a sliding glass door off the living room – a wonderful spot for contemplating stunning ocean views or watching Sea Ranch wildlife meander through the meadow below you. Thanks to Klaus and Gundi for a fabulous, peaceful and spectacularly beautiful long weekend. “This was our second stay at Bella Vista and it was every bit a pleasant as the first. Klaus was on time with communications and very accommodating host. Kitchen is well equipped, design and furnishings are very comfortable, ocean view is spectacular! Highly recommended. It truly is a beautiful view and a great accommodation." "Returning to Bella Vista after 10-years was better than we had imagined....and we imagined good:) Such a beautiful home and scenic location. We will be back. Great times and very special memories for us surround Bella Vista." "This is a wonderful home and location to get away from it all !! My sister and I needed a place to recuperate and unwind. Klaus and Gundi's home was just the ticket! Every morning we had breakfast and coffee on the deck. We loved seeing the ocean from inside and outside the house and loved the wild deer we saw in the neighborhood! Just a beautiful and relaxing experience. We would return and recommend their home to all our friends and family!" “The views are awe inspiring, peaceful & something you never dream of or get tired of. The house was very comfortable as a "home away from home," and we will definitely be back. The kitchen was well stocked beyond one's needs. The views and peacefulness made it difficult to return home to reality. It inspired me to follow my dream to retire on the Coast. The house was very clean and comfortable. I hope to be back soon. “Clean, with a great view. We watched deer graze and whales play from the deck." “My partner and I had such a relaxing time at Bella Vista! We felt comfortable and enjoyed being in this beautiful house with such a gorgeous view. We walked along Bluff Trail to the beach and enjoyed having our meals on the outdoor patio. Klaus was very communicative and gave us directions along with instructions for how to care for the house. Check-in was super easy. I recommend staying here if you find yourself looking for a vacation in Sea Ranch. “Beautiful home, great place to unwind from the hectic city. Your house was beautiful and very relaxing. Being a cook, I really appreciated the sharp knives. ...."
"Bella Vista is a wonderful place for a getaway to Sea Ranch. First of all, the house is situated on a knoll with unobstructed views of the sea from the living room, dining room and kitchen. The decor of the house itself is rustic, elegant and cozy—hard to pull off that combination, but the owners did it! The two bedrooms are comfortable and so nicely appointed. The house itself was immaculate, with three very clean and lovely bathrooms, a two washers and a dryer, beach chairs, and a charming porch from which to watch the breezes whip up the whitecaps in the afternoons. The owners supplied us with a generous selection of dishes, pots and pans and table linens…. everything we could have hoped for, with plenty of very useful instructions and welcome advice. I only hope it is available for our next visit to Sea Ranch." Additional, personal comment: "Your house is awesome! It is so welcoming, so warm, and yet keeps the rustic feel of Sea Ranch. We loved every minute of our stay there. You are terrific hosts! I cannot tell you how much we enjoyed the week in your lovely home." "Fantastic! Would definitely come again! You won't be disappointed." "An outstanding place for two couples in a gorgeous part of California. We loved the place! "Thank you Klaus and Gundi for sharing your home with us! A truly fantastic experience!" "Excellent home that we were privileged to enjoy. Exactly as advertised - even better. On a clear day, the ocean view from the home and surrounding area is spectacular. Thanks to Klaus and Gundi... great hosts." "Fabulous, luxurious, relaxing. Great hikes on bluff trail." "Amazing home with a stunning view. Quiet, beautiful and comfortable. Klaus is very helpful and accessible. We will be back. We fell in love with Bella Vista!" We "had another very enjoyable week at Bella Vista. 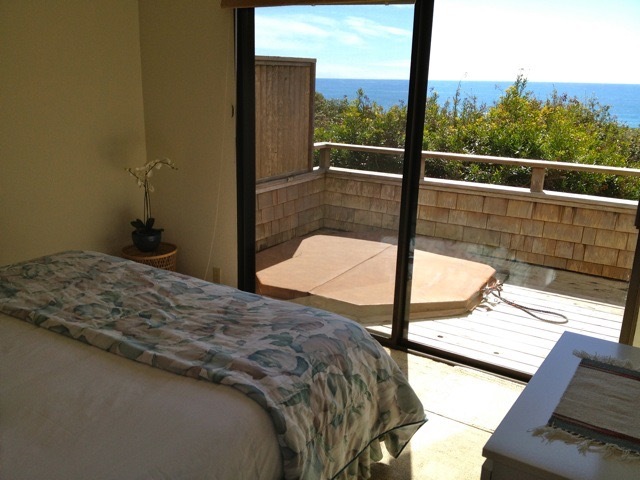 We think your Bella Vista (home) is on one of the best sites in the whole complex of Sea Ranch." "I had this long review all written up about this place detailing things like the spectacular views (the back of the house is basically all windows) of the ocean, the deer and many species of birds in the yard in the mornings, the coziness of the home itself with the wood burning stove and the warm cabin feel, the binder with all the info you could imagine on the home and the surrounding area, the peaceful, quiet and friendly feeling of the neighborhood (everybody waves), the close proximity to the ocean and on and on and on...trust me, It was a long review. But as I read it over to myself, it made me wish I was still there. That's when I realized when others read it, they may decide to go ahead and try it out for themselves. That may make it a bit more difficult for me to get this place when I want it again in the future. No bueno! So I decided not to write any of that stuff. I also chose not to write about how well we were treated by the owner with his quick/excellent communication and genuine concern in making sure everything was perfect for our stay. Sssoooo...yea. Sorry I couldn't help you." "We've rented homes in The Sea Ranch for close to 30 years and have seen a little of everything - from ultra modern to rustic, from the meadow to the hillside to ocean front. We rented Bella Vista for a long weekend and begged the owners to let us have an additional night. At the end of the day, Sea Ranch is about the sights and sounds and this home didn't disappoint. Knowing the Ranch's history, we knew the fact that Bella Vista is situated on one of the 'original' hills meant that the views would likely be spectacular -- and they were. Nearly 180-degree ocean views, and - even better - the sound of waves crashing the rocks just to the West of us. It was awesome. It's like a Sea Ranch hillside home with great views but the added benefit of hearing the waves; it's got the views of a meadow home without highway noise. The silence was amazing. We enjoyed a full moon, walked to gorgeous sunsets and woke to blue and white water views every morning. One more thing: the master bed was really comfortable - something you can't always count on. Thanks for that. Would recommend for adults of all ages." Coming back from a long walk along the beach yesterday, it dawned on me all of a sudden that I have never felt this relaxed in my entire life! So I am taking this back with me! Along with the joyfulness, the trails, the deer, red sunset ... "
"These are the most peaceful days I have spent anywhere in a long time! Magical! It won't be my last time here." "Bella Vista is a slice of paradise! Thank you for sharing this lovely place. The picture window, the comfortable seating, the all-around perfectly equipped house made our stay restful and enjoyable. We liked watching the birds, deer and sea lions. This was an ideal place to relax, read and enjoy the beauty of nature. We hope to return on an annual basis." "We had a lovely stay at Bella Vista! Comfortable, well-equipped, and clear instructions for everything. Especially enjoyed your lovely piano, at which I did the rough draft of several songs. Appreciated your library and CDs. We hope to return in the future." "We thoroughly enjoyed the beautiful ocean views (especially the moonlight on the ocean at night)." "Twenty years of visitors -- and the hospitality and warms of this place makes it clear why. We have stayed at several different Sea Ranch spots over the years, but this place has the best panoramic view and the best seats for looking at it. Also liked the great proximity to the north end, Salal trail, Gualala Point, Trinks and one right and good dinner at Uneda Eat in Point Arena." "This was our third time staying here -- and we love it! This time we were able to stay 4 nights! On the first night, at dusk, we saw a fox. Beautiful! Red ears , silver and black tail. We were on the back deck, and he/she was in the backyard, looking at us. Stayed a while. The next night he came to the sliding glass door and looked around. We saw him/her every day. Plenty of deer all around. First full day here was rainy -- which gave me a good excuse to read on the window seat. Loved it! Next day to Gualala at Trinks for coffee and sandwiches. Great food! Yesterday walked the bluff trail north; viewed Gualala from a different angle. We love staying at Bella Vista. The view is something else! Your home is so warm and welcoming." "Thanks so much for letting us stay at the wonderful "Bella Vista". What incredible ocean views. What tranquility. What beautiful night skies. We enjoyed the most relaxing holiday ever! The house was so well organized, uncluttered, yet very functional. We even got some ideas on improving the lay-out of our home (I have asked my husband to build me a pantry closet like the one you have.) Sea Ranch, as always, was spectacular. We enjoyed seeing a lot of wildlife: deer, sea lions, black and white 'pebble' fish, sea stars, sea anemones, skunk etc." "Thank you so much for renting your house to us. Walter and I had the most romantic weekend and loved your house. We hope to rent again from you and just wanted to send this note on what a beautiful experience we had." "Stayed here for my 50th birthday weekend in early October 2011. We have rented other homes in Sea Ranch in the past, but this was by far our favorite. The entire back wall of the house is windows, providing sweeping views down a sloping meadow to the ocean; the pictures you can see online do not do justice to this panoramic view. We'd sit in the living room or at the table on the back deck and watch raptors wheeling in the sky with the sunlit ocean as a backdrop. We also saw many other birds, along with many deer. On a more practical front, this was the best-equipped rental house we've ever rented. Real pots, pans, crockery, etc. Nice laundry setup in the garage. The most comfortable leather recliners and ottomans in the living room; I wanted to spirit one home with me. Even the knives in the kitchen were more than serviceable, and knives in rental condo/house kitchens are NEVER better than cheap garbage. We didn't do much prep in the kitchen, but we did some, and even though I brought my chef's knife with me, I never even unwrapped it. There was no need. The hot tub off the master bedroom was cozy and screened enough by foliage to afford privacy, yet open to the air. And it was even able to get the water hot enough for my tastes. The location is also prime. It was whisper-quiet, yet only 5 minutes to Gualala and the Surf Supermarket, a decent pizzeria, etc. Even closer is Sea Ranch golf course, which I hadn't played in years. What a great wild wooly track! Definitely a golfer's golf course. Klaus, the owner, was easy to work with, and provided extensive directions, instructions, etc. I recommend reading his excellent FAQ about the house before your visit. We would recommend Bella Vista to anyone. We're already plotting a return with some old friends with whom we sometimes vacation, because we know they'd love it also. Recommended for:Age 55+, families with teenagers, girls getaway, romantic getaway." Review Title: "Pictures do not do it justice"
"Every once in a while you just need a girls weekend. This was the perfect place to have it! We sat on the deck and watched the ocean as we had morning coffee. Spent the afternoon sitting at the kitchen table beading. The evenings were wonderful watching romance comedies and drinking wine. The kichen was well equipped with a view out to the ocean. After arriving Fri evening and unpacking, it was time to start dinner. everything was easy to find in the kitchen. We never left the house - watched the fog roll in and out, watched the stars come out and talked and talked and talked! Thank you so much for the use of your fabulous home. It was very welcoming and comfortable. I would recommend this to anyone wanting to beat the heat or as a respite from a hectic daily life. Recommended for:Age 55+, families with teenagers, girls getaway, romantic getaway, sightseeing." Review Title: "Girls weekend getaway"
"My fiance and I visited Bella Vista for a weekend getaway to get much needed rest and relaxation. That is exactly what we got. It was peaceful, quiet, close to the trails, and great views of the coast. " Review Title: "Excellent retreat, quiet, and romantic"
"My brother (from CA) and I (from MO) have been renting vacation property near California's coast for our annual "family reunion" since 2008. "Bella Vista" was our very favorite by far! Most of our days were sunny, and the panoramic view of the ocean was spectacular. The interior of the house is beautiful and functional, and the owners were very cooperative. We highly recommend it, and we are looking forward to spending more of our "reunions" at "Bella Vista." "I had the opportunity to stay at Bella Vista just last weekend and it was absolutely beautiful!! It was quiet, peaceful and the views from almost every room are gorgeous. The home is well taken care of with a fully stocked kitchen, great sound system for music and a nice tv (although I never turned it on). I would highly recommend this home to anyone looking for an ocean escape! Thank you Klaus!! It is exactly what I was looking for at the Sea Ranch!!" ... you will LOVE it at "Bella Vista." "My husband and I stayed at Bella Vista for 5 days in July 2010 and had a couple visit us for the weekend. This property is more beautiful than described, with exceptional views and and feeling of tranquility, privacy, peace that permeates the entire space. We used the kitchen and grill the entire time we were there, taking advantage of the well stocked pots, pans, utensils and even multiple spices available. The hot tub was private, clean and comfortable. Everything was easy to find and explained thoroughly either by Klaus beforehand or through instructions in the house. We brought our own bikes and enjoyed the trails throughout Sea Ranch, venturing all the way down to the lodge and I also took the free yoga class on friday morning at the Rec. Center. Bella Vista will not disappoint!!" "Beautiful views, truly peaceful and quiet, with all you need to relax and enjoy the setting. Arrangements with the owner were well facilitated, instructions excellent, and the property was clean, well equipped, and user-friendly. Very comfortable for two couples; easy to use kitchen and hot tub. A lovely, very large lap pool is a short walk away."